André René Roussimoff (19 May 1946 – 27 January 1993) better known by his ring name, André the Giant, was a French professional wrestler and actor. He was best known for wrestling with World Wrestling Federation (WWF). His size was caused by gigantism, that was caused by excess growth hormone and would later result in acromegaly. His size led to him being called "The Eighth Wonder of the World". During his professional wrestling career, he was a one time WWF champion and a one time WWF World Tag Team champion with Haku. In 1993, He became the first superstar to be inducted into the WWE Hall of Fame. His best know acting role was as Fezzik in the 1987 movie The Princess Bride. On January 27, 1993, he died of congestive heart failure while he was sleeping in his Paris hotel room. He was in Paris to go to his father's funeral. He was ranked #3 of the 500 best singles wrestlers of the "PWI Years" in 2003. ↑ "NWA Florida Tag Team Title". Wrestling-Titles.com. Retrieved 2014-01-07. ↑ "International Wrestling Alliance World Tag Team Title". Wrestling-Titles.com. Retrieved 2014-01-07. ↑ "NWA United States Tag Team Title". Wrestling-Titles.com. Retrieved 2014-01-07. 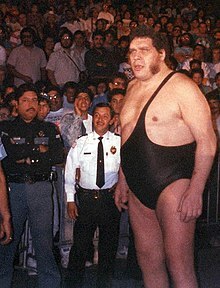 ↑ "Professional Wrestling Hall of Fame: Andre the Giant". Professional Wrestling Hall of Fame. Retrieved 2014-01-07. ↑ "Pro Wrestling Illustrated Award Winners: Most Popular Wrestler of the Year". Wrestling Information Archive. Retrieved 2014-01-07. ↑ 9.0 9.1 "Pro Wrestling Illustrated Award Winners: Match of the Year". Wrestling Information Archive. Retrieved 2014-01-07. ↑ "Pro Wrestling Illustrated Award Winners: Most Hated Wrestler of the Year". Wrestling Information Archive. Retrieved 2014-01-07. ↑ "Pro Wrestling Illustrated Award Winners: Editor's Award". Wrestling Information Archive. Retrieved 2014-01-07. ↑ "Pro Wrestling Illustrated's Top 500 Wrestlers of the PWI Years". Wrestling Information Archive. Retrieved 2014-01-07. ↑ "Stampede Wrestling Hall Of Fame (1948-1990)". Wrestling-Titles.com. Retrieved 2014-01-07. ↑ "Austra-Asian Tag Team Title". Wrestling-Titles.com. Retrieved 2014-01-07. ↑ "WWE Championship - Andre the Giant (February 05, 1988 - February 05, 1988)". WWE. Retrieved 2014-01-07. ↑ "World Tag Team Championship - Andre the Giant & Haku (December 13, 1989 - April 01, 1990)". WWE. Retrieved 2014-01-07. ↑ "Wrestling Observer Hall of Fame Inductees". Wrestling Information Archive. Retrieved 2014-01-07. This page was last changed on 18 August 2018, at 19:12.